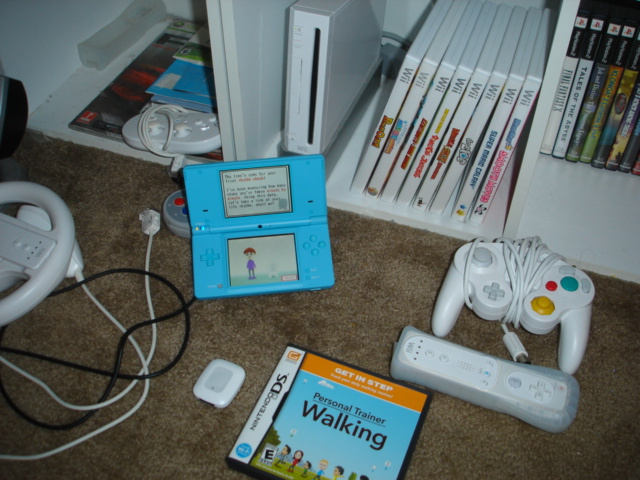 We recently got in the upcoming DS title Personal Trainer: Walking and we've had a chance to spend a little time with it and we think gamers who want to increase their fitness level are in for a treat with this interesting new DS game package. Inside the package you basically get the DS game, two Activity Meters, and two clips for clipping the Activity Meters onto your belt or pet's collar. That's right, one of the Activity Meters can even be used by your pet and the game even allows you to set up a game data profile for it. Of course for your own profile you can even transfer your Mii from your Wii console to your DS system for use in the game or create one from scratch. It's basically up to you. You can put the Activity Meter in your pocket, your handbag, or even clip it on your person somewhere. If you want to use one of the meters for your pet, you merely clip it onto your pet's collar. As you move around, the Activity Meter records your steps and stores the data inside. Anytime you want to download the data to your DS system, you merely click on the button that's located on top of the meter and it will automatically transfer the data wirelessly to your system and the game will compile the data accordingly. You can then see readouts of your daily activity via charts and graphs and the game will even allow you to set Step Goals of whatever number of steps you're shooting for each day. It's set on 3000 steps as a default. The program itself is really easy to use and inputing your activity from the meter is as easy as pushing a button. Anyone who's enjoyed Wii Fit is likely to get a real kick out of this game. I caught myself looking forward to the times when I'd get home and could download the data from the meter to see what my daily rhythm was like. And being able to keep track of it every day is even better as you can chart which days you're more active, as far as walking goes. I can say this, my dog walks a lot more than I do each day. It's a wonder that dog is still upright. When it comes right down to it, this is something that can be quite useful for people who are trying to get more fit and lead a more active lifestyle or even people who just want to know how active they truly are in their day-to-day lives. We'll have a full review of the game up early next week, just in time for the game's May 26th release date. Ehhhhhhh I could see it being a DSiWare release, but retail? Nehhh. Oh, I guess it comes with clips. LOL. You think that's showing off. I took a panorama photo of my game room the other day that would probably put you into a coma. This reminded me of the Pocket Pikachu, I got both versions of the thing, nice little gizmo. More on topic, I remember to have seen some step counters that do almost the same that this "game", I wonder how much will it cost in comparison to those. I'd like to see that other photo Corbie. "I took a panorama photo of my game room the other day that would probably put you into a coma. " It's not quite finished yet as I cut the left side of my arcade cabinets off the first time though. I'm photographing all of my stuff in order to insure it all. Something I've put off for some time now. I'll be sure and post it in the forums when it's all ready. "It's set on 3000 steps as a default"
If a person is only walking 3000 steps a day they have to be a fatty. Or sitting at a computer desk every free minute of the day working on video game media stuff. Although I have put on a little weight these past few years. First DS game this year I might buy day one. It is worth noting that this game package is $50. Wow, this sounds great, I'll get this for sure! Hey, how can YOU put on weight? Aren't you a skeleton? My ego swells and it weights me down. I actually pre-ordered it some time ago for £24.99. Its release was delayed in the EU (and everywhere I expect). I am into "fitness" software like this and wii fit. Ill be getting this, got it preordered.. its pretty interesting and kinda cool. I hope that they make more games that let you convert miis to your DS. Sounds like a must buy. I really want this actually - I'm a little obsessed with fitness games. "You know, you should just make an article where you take pics of your room so we can all be jealous. I can't get over how sweet your TV is......"
How do you know what his TV looks like? It might be due to the fact that I take every opportunity to show it off that I get.